Thanks to Lunch’er Mike for passing along this great news… the latest branch of the Italian gelato shop Grom (on Broadway btw. 58+59th) will be opening tomorrow (5/7) at Noon. And gelato super fans know what that means… FREE GELATO!!! If you’ve never had Grom before, it’s pretty much the best (but most expensive) gelato of all time… so free makes this the best ice cream/gelato deal of the century (we recommend the pistachio.) From Noon to 9pm. Freeloaders engage. 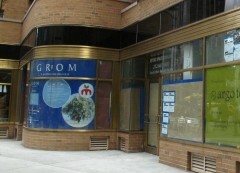 Posted by Zach Brooks at 11:45 am, May 6th, 2010 under Free Stuff, Grom. I *still* want a ML t-shirt that says (on the back) “freeloaders engage”! A Streetmeatpalooza-themed t-shirt would also be very cool. so tomorrow will be my first and last time there. I have been to the one in the village and it was excellent but this will be great near columbus circle. Glad they are opening in this location!! Has anyone made it over there yet? I was going to swing by after work. There was a small line around 2 – basically to the entrance of the tea place that’s opening soon (they were handing out samples of iced tea, but I don’t remember which day they said they were opening.) The gelato was decent, but I just came back from a trip to Europe, so the memory of excellent gelato in Italy hasn’t faded enough for anything in the US to compare yet. But it was worth the trip, as it was a free $5+ cone. Tea place was open this morning 05/10/10 when I walked by.